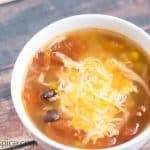 Chicken Tortilla Soup is quick, easy and really yummy recipe. 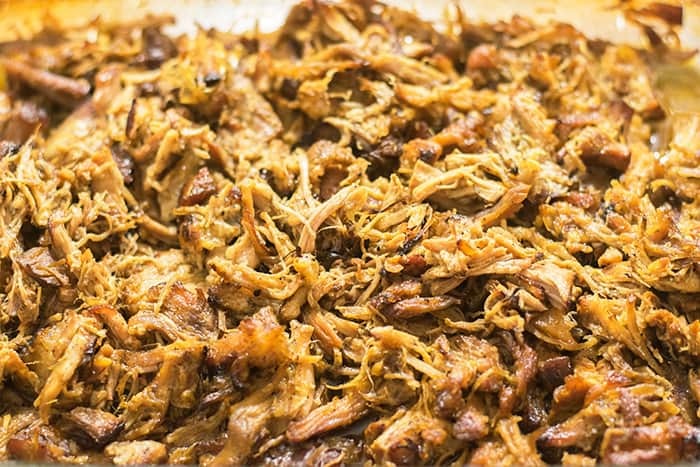 It’s a super quick and delicious recipe that every busy mom should know how to make. It will also make for a comforting meal during the upcoming chilly Fall and Winter weather. Plus, chicken tortilla soup is the perfect way to add a little flavor. So I actually made this chicken tortilla soup last week on Sunday. Sunday, unfortunately, was a very lazy day for my family which is unusual. We usually get up early to go to church and then we come home and I usually make a big dinner. But not last Sunday. I stayed in bed until around 12 while my husband took care of the kids. When woke up I was so angry with myself. I hate sleeping that late when there’s so much more I could be doing. But sleeping in once in a while won’t hurt right? And us moms definitely deserve it! Since I slept so late that day and wasn’t able to get much work done I decided to keep dinner simple and easy. My husband wanted to get a rotisserie chicken from the grocery. 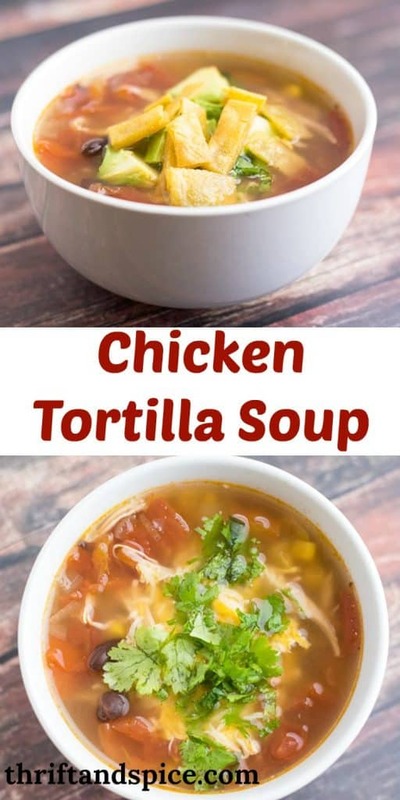 So I immediately thought of making chicken tortilla soup with the leftover chicken meat. I’ve been making lots of soups recently. In fact I made one a few weeks ago that I think you’ll really love. It’s called caldo de pollo . It’s a Mexican chicken soup that is the absolute best especially when you’re sick. So my husband went and got the chicken and I took what I wanted from it and ended up with 2 cups of shredded chicken. I usually always try to make everything from scratch because it’s cheaper. but I think we all deserve a break every now and then so I used store bought chicken broth. And honestly, it felt real good not slaving over a hot stove all day! However I did make my own tortilla chips but that was a breeze. 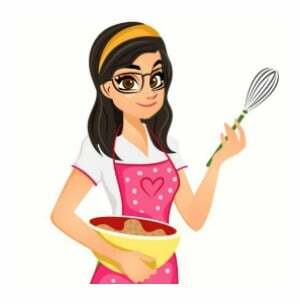 If you’re interested in making your own tortilla chips check out my post on it here . That post will explain how you can make your own tortilla chips. For your usual tortilla chips you cut the tortillas into triangles but for this soup they are cut into small rectangles. Despite getting my Sunday off to a bad start it certainly ended well with a delicious and super easy chicken tortilla soup. If you’re looking for more easy and quick soup recipes I think you’ll love my sopa de fideo. It’s a Mexican noodle soup. Who doesn’t love noodle soup? Use store bought chicken broth for the 64oz of chicken broth. Crumbled Tostitos work in place of the homemade tortilla chips, but these are so good that you won’t want to take that shortcut. Add spice by using cayenne pepper or red hot. 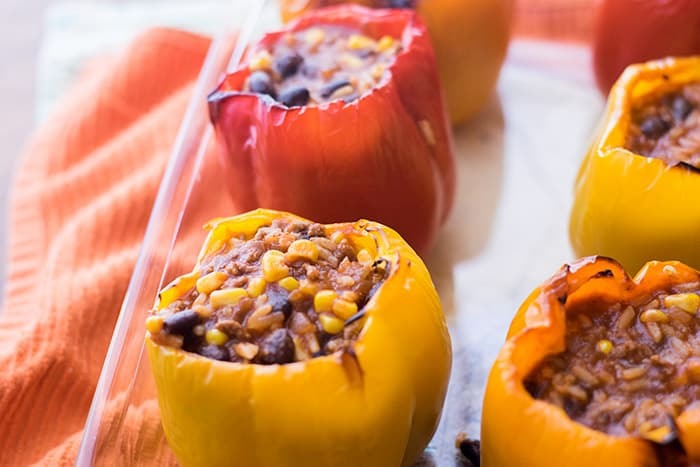 Double the recipe to have enough for lunches during the week. 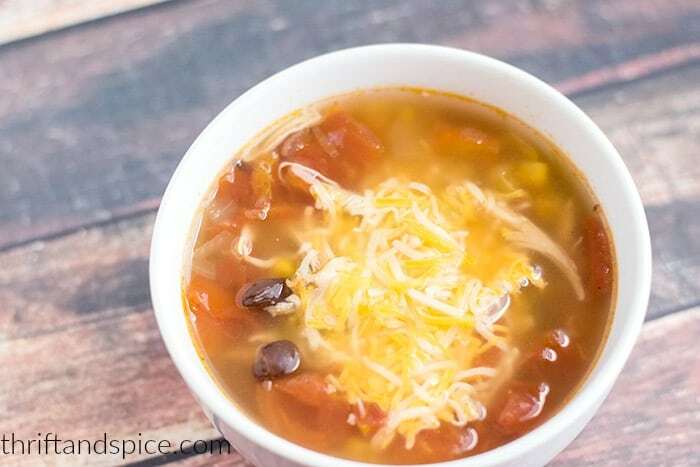 A flavorful chicken tortilla soup recipe with homemade tortillas and store bought rotisserie chicken makes this the perfect easy weeknight meal. In a pot over medium heat add the olive oil. When hot add the onion and saute for a minute or so. Add the chicken broth, corn, tomatoes, black beans, garlic powder, ground cumin and chili powder. Stir and bring to a boil over medium high heat. Reduce heat to medium low and simmer for about 30 min. While soup is simmering take out the corn tortillas and cut them into small rectangles. Fry the small rectangles in vegetable oil until golden. Drain the tortilla chips on a paper towel lined plate. When soup is done simmering stir in the shredded chicken and simmer for a few more minutes until chicken is heated through. Season with salt to taste if desired. Serve and garnish the soup with cheese, cilantro, avocado and corn chips. When soup is cool refrigerate the leftovers. 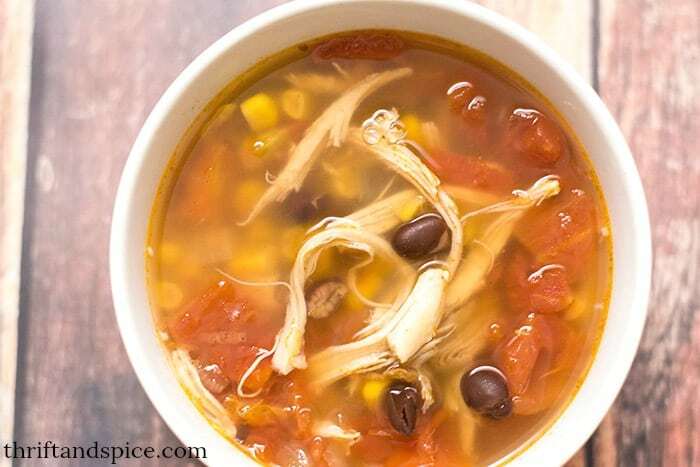 If you liked this Chicken Tortilla Soup recipe you might also like…. 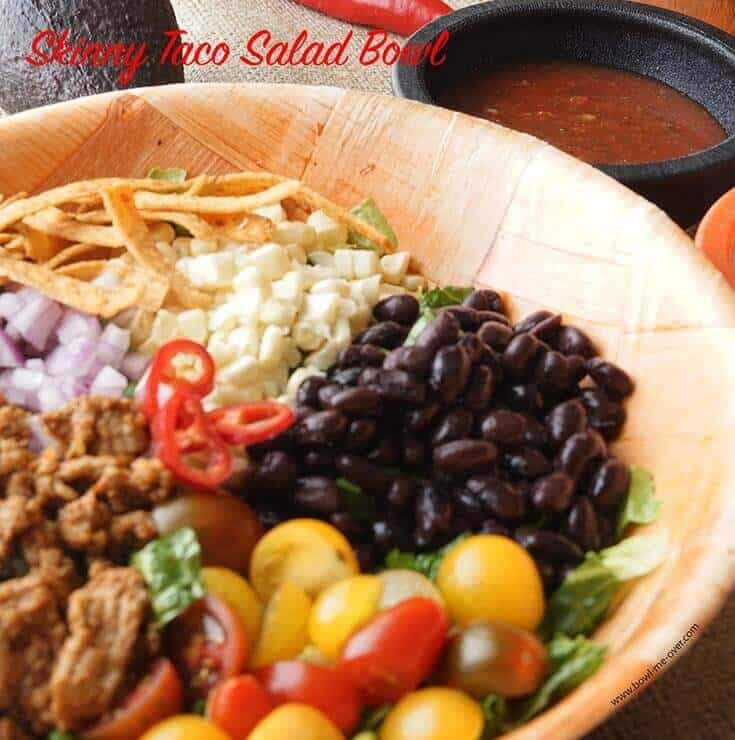 From left to right: Skinny Taco Salad, Easy Stuffed Bell Peppers (Mexican Style) & Crispy Pork Carnitas.